Visual Arts students at The Sixth Form College, Solihull visited Oxford this week for a visual recording trip to three museums. 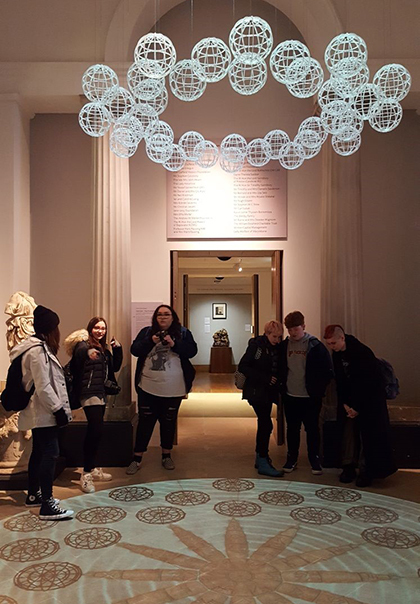 Students from the A level Fine Art, Graphics and Photography courses spent the day at the Ashmolean Museum, the Pitt Rivers Museum and the Museum of Modern Art in Oxford. At the Ashmolean Museum, whose collections range from Egyptian mummies to contemporary art, students saw pieces such as the Alfred Jewel, a ceremonial suit of armour for a samurai, the sarcophagus of Djed-Djehuty-Ieuf-ankh Mummy, artwork from Michelangelo and paintings from Turner. At The Pitt Rivers Museum, the exhibits included John Wreford’s photographic portraits of people displaced from Syria. Meanwhile, the collections at the Museum of Modern Art included tapestries from Hannah Ryggen and sculpture from Nicolas Party. Students on all three A level courses are producing portfolios of work throughout the year. This work will be exhibited at an end-of-year show, which will launch with a private viewing on Tuesday 19 June from 6.00 – 8.00pm.